There are many ways to spend your leisure time in Greater Mankato. Nestled in the scenic Minnesota River Valley, Greater Mankato is a haven for outdoor enthusiasts who enjoy the area's abundant wildlife, water and recreation activities. In addition to the scenic beauty of the Minnesota River, there are numerous lakes throughout the area. Greater Mankato has more than 60 parks and 50 miles of paved trails for walking, biking or skating. And for the more active outdoor enthusiasts there are hills to climb up or ski down. Sports, entertainment and cultural events are also plentiful. With 5,000 seats and additional meeting spaces, the Verizon Center hosts concerts, conventions and sporting events. With a thriving arts community, Greater Mankato is home to a variety of theater, music, dance, visual and written arts programs. We are also a retail center, with hundreds of stores and restaurants, ranging from national retailers to quaint local shops. No matter what your interest, there's always something to do in Greater Mankato. For more information visit the Visit Mankato, City Center Partnership and greatermankatoevents.com websites. 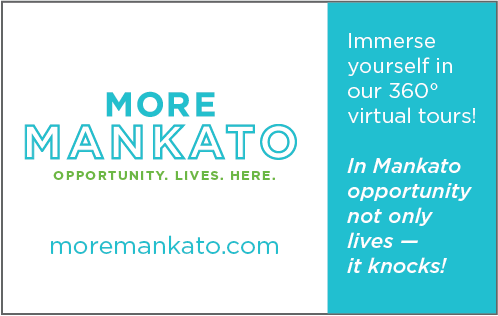 Go to the Visit Mankato website to find our all about exploring the Greater Mankato Region! From living, visiting or meeting in the region, Visit Mankato is your source for information on the regions outstanding activities and attractions! Visit Mankato is an affiliate organization of Greater Mankato Growth, Inc. The City Center Partnership works to build a vibrant City Center in Mankato/North Mankato that exemplifies the vitality of our region, and attracts visitors, residents, businesses and investment. Their website is your source for experiencing and learning more about the bustling scene downtown. The City Center Partnership is an affiliate organization of Greater Mankato Growth, Inc.
Where to go for what to do! 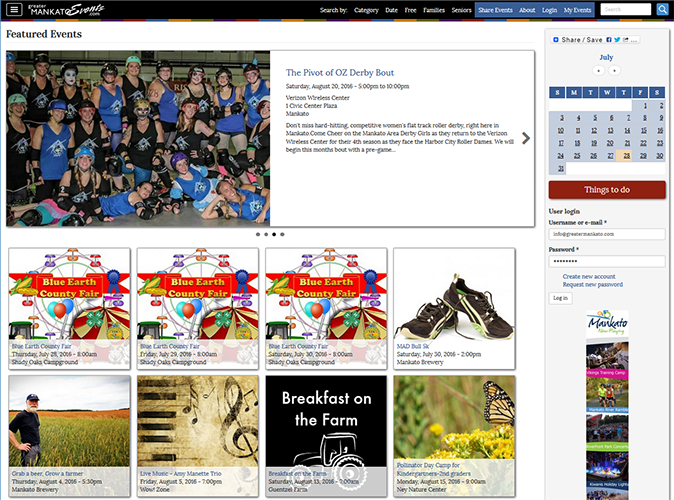 This website is your community calendar for public events with entertainment value in the Greater Mankato, Minnesota area. Greater Mankato Growth is a proud founding partner of this calendar.